Helsinki -- Peak power in Finland doesn't occur in the afternoon. It actually happens early in the morning. That's because many homes are equipped with electric heating systems, and consumers turn them on to keep warm in the early morning hours, according to Vesa Koivisto, the business development manager at Fortum, a large power producer and electrical distributor in the Nordic region. Power prices can swing from zero Euro cents per kilowatt hour to 1.40 Euros ($1.72) per kilowatt hour. An average home consumes about 9,000 kilowatt hours a year, he added. "We don't have the 5 o'clock tea-time peak," he said during a meeting in Helsinki. "If you don't have district heating, chances are you are heating with electric." Electric heating systems operate like tea kettles: an electric element immersed in the water heats it up. Thus, if consumers have an efficient heating system, they can schedule it to heat the water during lulls in the price. The new pricing regime will get introduced in conjunction with a plan to let retailers and distributors get power from Nord Pool, the regional electrical exchange. Right now, Finnish consumers effectively get their power from the nuclear, gas, coal and biomass facilities within the country's borders, Koivisto explained. Under Nord Pool, electrical distributors and retailers will be able to tap power from Norway and Sweden, which have more hydroelectric power. Hydroelectric prices vary by water volume. "With deregulation, you could see the cheapest price randomly," he said. Will consumers like real-time time of use pricing? The results aren't yet clear. Fortum installed smart meters equipped to handle time of use pricing in Sweden last year. "Then we had the coldest winter in 30 years," said Koivisto. "I have a heat pump, but even my utility bills went up 35 percent." Complaints began. Because the smart meter programs come as a result of EU mandates and other directives, there is little danger of them being reversed. Still, like in the U.S., utilities and retailers hear plenty of complaints when power prices spike. 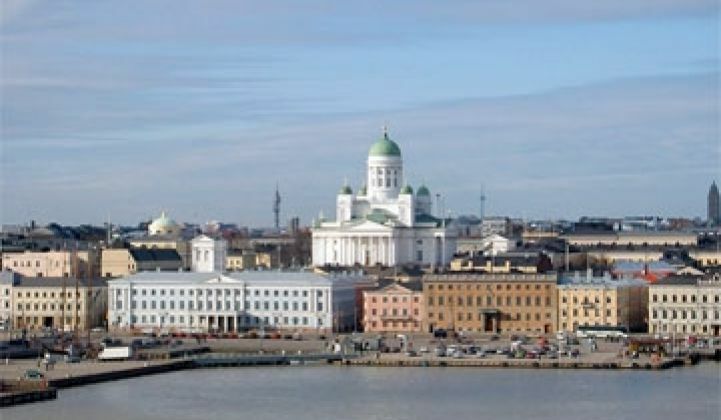 Fortum will start rolling out its smart meter program in Finland next year. Like nearby Denmark, Finland is also placing an emphasis on electric cars. (Valmet, which will assemble cars for Fisker Automotive, is based in the country.) One advantage: the basis of a charging station network already exists. Because of the frigid temperatures that persist through much of the year, Finland has installed 1.1 million electric car heaters across the country. The heaters don't exist to warm the interior cabin: they keep the engine block warm. "With a minor modification, you can convert one to a slow charger," said Koivisto. The national government is also contemplating increasing the tax incentives for going electric. The region will also see the growth of high-end, energy efficient communities in the years ahead. Fortum, ABB and contractor Skanska will break ground in the fourth quarter on a live/work building with 42 apartments festooned with EV charging stations and 120 square meters of solar panels, located near Espoo. Unlike many other apartment buildings, heat will be decoupled from the lease, thereby encouraging conservation, he said. Meanwhile, Sweden plans on erecting a community in Stockholm with 30,000 residences and 10,000 offices.